You know it's going to be a good hike when your first task is "Locate the field agent." Of course, my husband and I managed to first locate a rather militant-looking bird-watching expedition and a cadre of school children before finding the Atlas Obscura field agent, but it was all good. 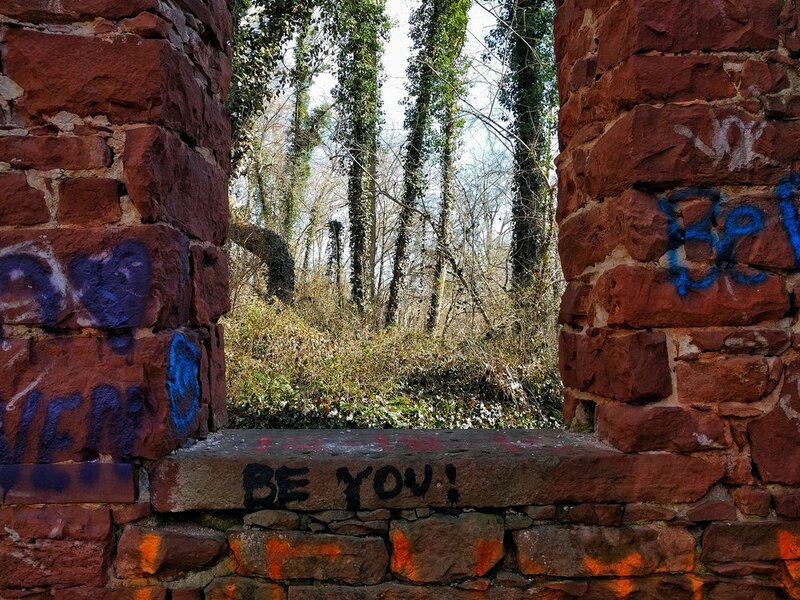 We had traveled down a rather nondescript, gravelly road that spit out into a parking lot in the shadow of a sturdy brick structure. Emerging from the car, we realized we had ended up on the Potomac coastline. Across the grey, slightly choppy river was....the Trump National Golf Club. Oh dear. But anyway. This was the start of our first adventure with the DC Obscura Society, an on-ground-branch of Atlas Obscura (by the way, this post is not sponsored in any way by Atlas Obscura. I'm just a nerd). 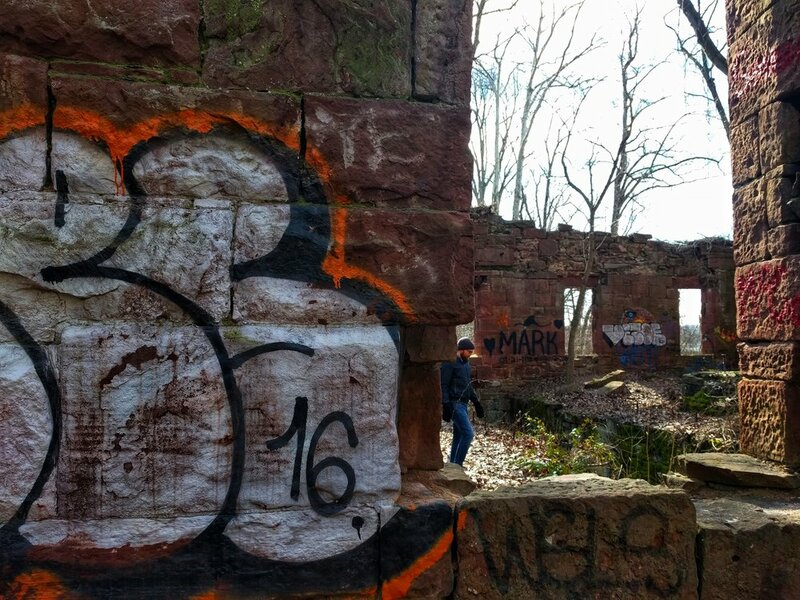 We were there to explore the ruins of Seneca Quarry, a historically significant site that has largely fallen into disrepair. Our guide Garrett Peck wrote the book on the history of Seneca Quarry - no but really. Our tour started with an in-depth explanation of the Seneca Aquaduct - the only acquaduct in the States that also serves as a lock. From there, our tour went way off-trail, as we explored the derelict stone-cutting house (majestic old stonework now covered in colorful graffiti, though the site is surprisingly trash-free), three quarry sites still bearing scars and apparatus from mining days, and massive fence piers that used to line Layafette Park and now site, unceremoniously, in a pile by the side a gravel trail. The significance of the Quarry in a nutshell is that it provided the unique red sandstone that makes up many gorgeous structures in Washington DC, most notably the Smithsonian Castle. My favorite fact of the day? I The sandstone originally starts off a soft grey color - but as the iron in the stone oxidizes it both turns red and becomes incredibly strong. Kind of the ultimate sedimentary hack, in my opinion. I'll be honest - a lot of the details of the history, canal and lock functions, and mining techniques went over my head. However, Peck was so obviously entranced with the history that his enthusiasm was absolutely contagious. All in all, it was pure pleasure to spend an afternoon covered in mud, climbing over rocks, and learning new things. I'll definitely be joining the Obscura Society adventures in the future - and of course will be sharing about them here!